People with Parkinson’s disease and cognitive impairment have disruptions in their brain networks that can be seen on a type of MRI, according to a study appearing online, December 7, in the journal Radiology. Study of the changes related to cognitive impairment in PD is imperative in order to be able to answer patients’ questions and finally be able to predict the future development of this condition. People with Parkinson’s disease and cognitive impairment have disruptions in their brain networks that can be seen on a type of MRI, according to a study appearing online in the journal Radiology. Parkinson’s disease (PD) is a progressive disorder of the central nervous system characterized by tremors or trembling and stiffness in the limbs, impaired balance and coordination. It affects about 10 million people worldwide. As PD progresses, many patients develop mild cognitive impairment (MCI), a decline in cognitive abilities, including thinking, memory and language. MCI can be identified in approximately 25 percent of newly diagnosed PD patients, and patients with MCI progress to dementia more frequently than those with normal cognitive performance. The study group was made up of 170 PD patients, including 54 with MCI and 116 without, and 41 healthy controls. 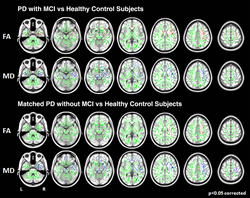 Analysis of imaging results showed that only PD patients with MCI had significant alterations at the brain network level. Measurements of the movement and diffusion of water in the brain, an indicator of the condition of the brain’s signal-carrying white matter, differentiated PD patients with MCI from healthy controls and non-MCI PD patients with a good accuracy. Researchers said the results show that cognitive impairment in PD is likely the consequence of a disruption of complex structural brain networks rather than degeneration of individual white matter bundles. “If confirmed and replicated by other studies, these results would suggest the use of MRI in PD to support the clinicians in monitoring the disease and predicting the occurrence of cognitive complications,” she said. “Structural Brain Connectome and Cognitive Impairment in Parkinson’s Disease.” Collaborating with Drs. Filippi, Agosta and Galantucci were Elka Stefanova, M.D., Silvia Basaia, M.Sc., Martijn P. van den Heuvel, Ph.D., Tanja Stojković, M.D., Elisa Canu, Ph.D., Iva Stanković, M.D., Vladana Spica, M.D., Massimiliano Copetti, Ph.D., Delia Gagliardi, M.D., and Vladimir S. Kostic, M.D.